My review: I love a Regency romance – I think its partly because I’m British and from London and the majority are set in London. I don’t have to google where places are and what they look like – I know where they are. The Governess Affair was short, sweet and to the point. 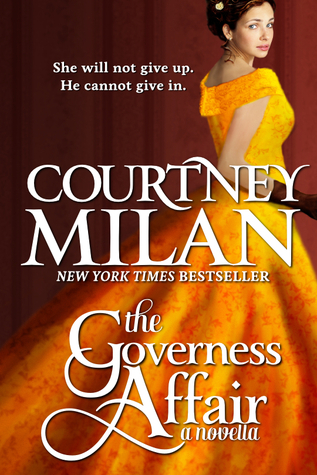 I read the first chapter of the first full length novel in the series and The Governess Affair puts a lot into perspective. It makes for a good and relevant prequel. I have, in the past found that a lot of prequels have no relevance to the actual story and just there as some sort of twisted filler. The Governess Affaie did not have that vide. So we have, as is typical, a Duke and his man but as is not typical The Governess Affair follows the man and not the Duke. Hugo Marshall – pugilist, coal miners son and bookkeeper for the Duke of Clermont, he is by definition not an aristocrat but he gives off this vibe that he is aristocratic, noble and honest as well as a vibe that just screams “run and run away quickly!” I introduce you to The Wolf of Clermont. Serena Barton – disgraced unemployed Governess, future wife, stubborn and oh yeah, pregnant. She is a scandal just waiting to happen. The storyline is basically a scandal throughout and what The Wolf will do to fix it. He makes a pooling in getting to know Serena after The Duke of Clermont tells him to make her go away due to an employment dispute. Turns out that it isn’t so much an employment dispute as an unplanned pregnancy and adultery. As I said before, it is short, sweet and to the point; the writing style flowed well and had a smooth transition between one character to another. My only irritation with it was that it was too short. Way too short.